White fingernails, white dresses and tanned skin. A picture that you can see from Instagram again and again in summer. The teeth appear brighter, the complexion more balanced, small impurities disappear. But one should avoid sun-tanned skin so urgently. UV radiation has nothing positive, it causes the skin to age faster, in the worst case it leads to skin cancer and damages the cells. So for me, sunbathing without sun protection is out of the question and even well creamed in and protected, it usually gets too warm after a few minutes catching some sun rays and I look for a shady place. But since I still look fresher with slightly tanned skin and would use a small moisturizer anyway, I have mixed myself a self-tanner from only three ingredients without further ado. I have consciously chosen Erythrulose for my DIY. If you want to tan the skin with natural substances, you can do this either with DHA (dihydroxyacetone) or erythrulose. Dihydroxyacetone is often used in natural cosmetics, as the tan becomes visible after just three to six hours. After a few days, it slowly disappears again. However, the substance becomes problematic at warm temperatures and long storage periods. The raw material should always be stored at 2-8 degrees, but it may have been on the shelves alone at room temperatures for some time. However, when stored badly, in the sun or in the bathroom, formaldehyde can split off, a substance that is considered to be carcinogenic. Of course, a self-tanner with DHA is also otherwise preserved and only tiny amounts of formaldehyde are produced which are often below the limit values, but I prefer the alternative, also because I don’t always want to store the self-tanner in the refrigerator. Erythrulose is a reactive ketose, too but it is more stable. As a result, formaldehyde is not split off so quickly, but the tanning effect only comes into its own after a few days. The tan is usually more even than with DHA and more long-lasting. In addition, the finished product smells much less of the typical “self-tanning smell”. Caution: Self tanner only colours the skin, but does not protect it from the sun, so you should'nt always(!) use sun cream. My recipe is simple and quick, the original idea comes from Agata and while I’ve been planning to try it for years, it actually only worked this year. You can find her article here on Magi mania.de and if you are interested in the topic, I strongly advise you to read it, as it is extremely informative. 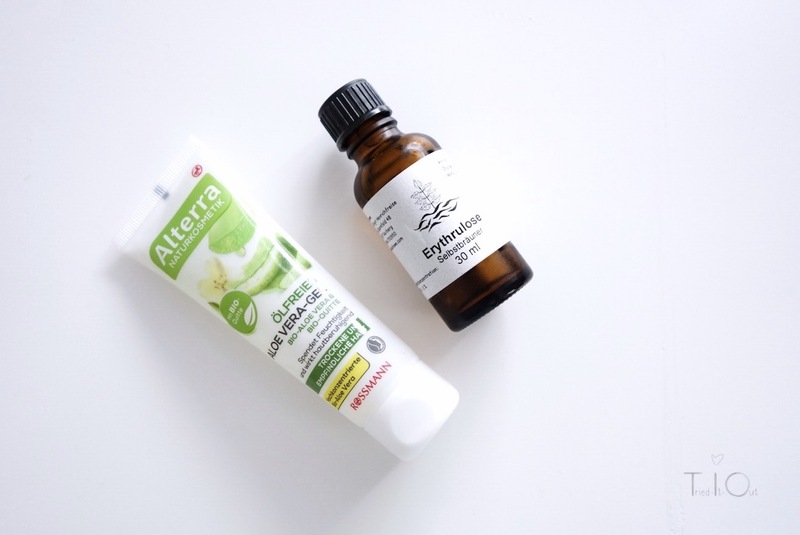 :) The DIY is quite popular because natural cosmetic self-tanners which are formulated exclusively with erythrulose are usually also quite expensive (from 30€) and 30ml of erythrulose cost for example at behawe just under 11€. First I mixed her recipe with the aloe vera juice from Rossmann (enerBio). The result was a light, pleasant tan, which was only slightly patchy in some areas. This was especially due to the fact that the texture was still too fluid and could not be distributed optimally. 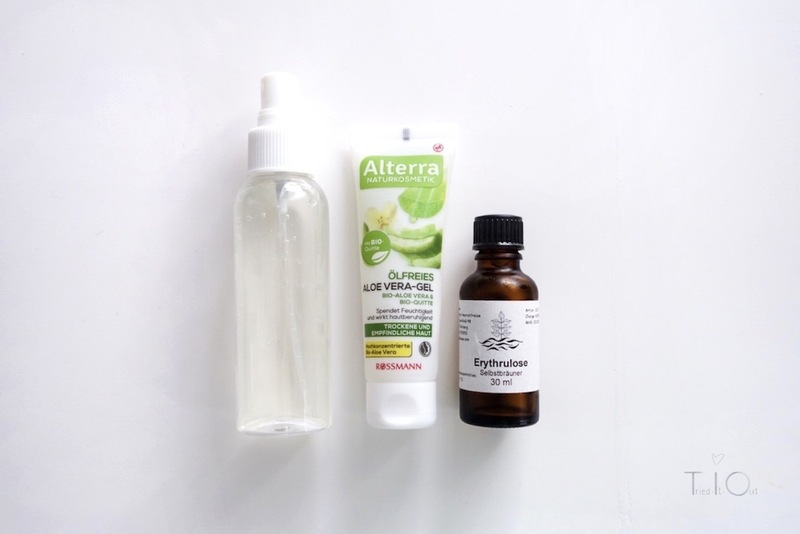 Since I didn’t want to order extra aloe vera extract and still had a bottle of Alterra’s aloe vera gel at home (probably the best remedy for my hair tips and lengths), I tried it without further ado. Erythrulose only works at a pH of the final product of 4-5, so I would not recommend simply mixing the erythrulose into anything. As Aloe Vera has a pH value of 4.5 and helps to distribute the product well, it is the best choice in principle. Nevertheless, the gel works great for me in combination with distilled water. 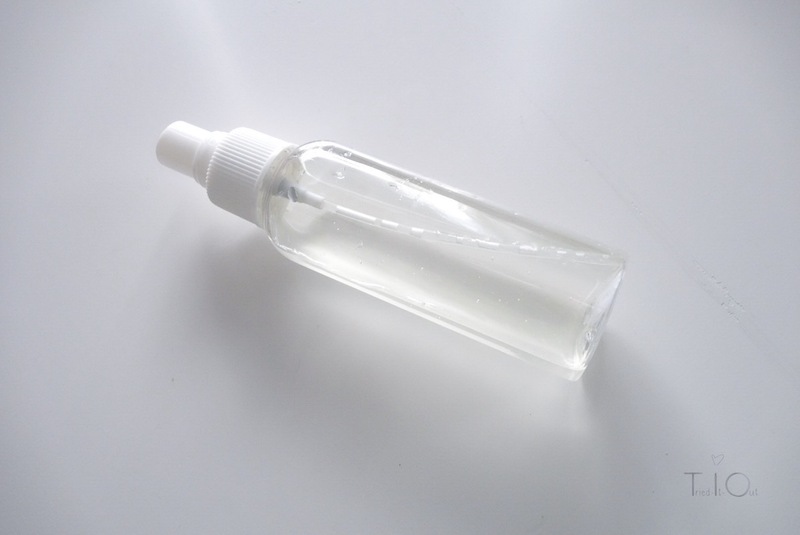 To sustainably upcycle, you can simply use an old spray bottle, such as facial toner. I love the Dr. Hauschka Tonic spray bottles, the mist is extremely fine. 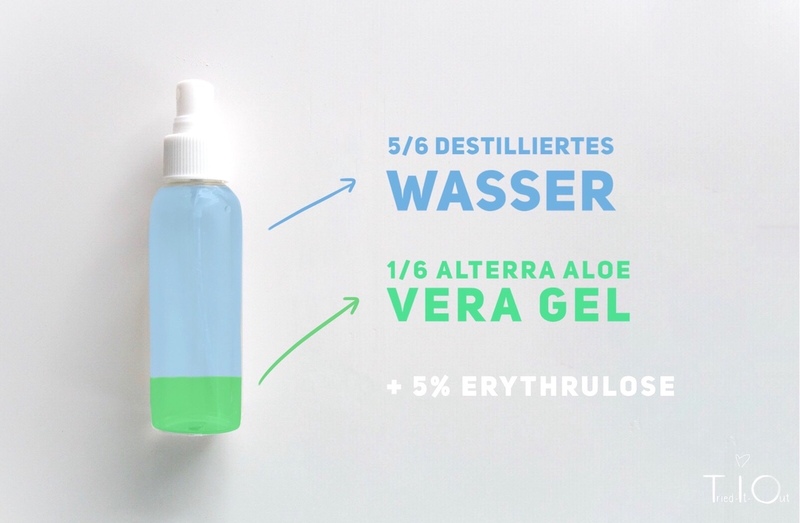 Fill 1/6 of the spray bottle with Aloe Vera Gel. With a 100ml bottle of the self-tanner, for example, this is about 16ml. Now add 5/6 distilled water, i.e. approx. 84ml. You then add up to 5% erythrulose. With the 100ml this is then up to 5ml. With Behawe Erythrulose, 20 drops correspond to one milliliter, so you need 100 drops. Agata uses only 3ml i.e. 60 drops, but I like a slightly stronger tint. 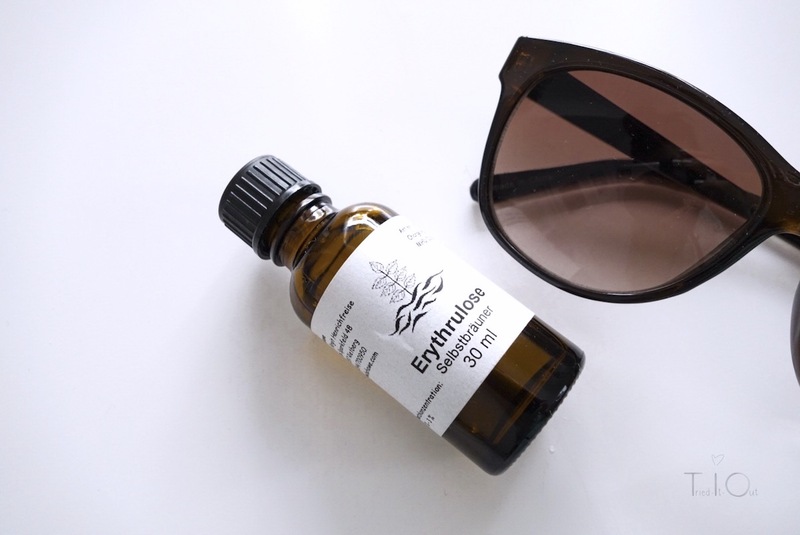 If you are unsure, add 60 drops to the spray bottle and if you want a more intense result, you can still add more erythrulose. The finished self tanner is not secondly like a product you buy in the store, so it will last for a shorter time. You can use it for at least two weeks, I even suspect that it will last even longer thanks to the preservation of Aloe Vera gel. Personally, I keep it in the fridge. Due to the gel and the vegetable thickener contained in it, the end product can be distributed wonderfully and does not get any streaky with me. The result is a light moisturizer that gently and evenly tans my skin, but not as strong as comparable products with DHA. In principle, however, one could also increase the proportion of erythrulose even further, but I also use the self-tanner in the face, where according to Agata a maximum amount of 5% is recommended. If you are still looking for a good sun protection, you can have a look around here (Beautyjagd, Peppermynta andalabstermaedchen), unfortunately, I did not come to a comparison this year due to lack of time, currently, I use the LSF50 Sunspray from Alga Maris again. Have you ever used self-tanning lotion? Do you cream yourself in summer anyway or do you completely do without care? Do you pay special attention to sun protection or haven ’ t you dealt with this topic so much yet? I'm also a self-mixed erythrulose self-tanning, However from erythrulose and pure aloe vera gel, This is liquid. I love the simplicity behind it and is so simple with spray bottle, It is not even particularly expensive, to apply it evenly (: . In the summer I care fact rather less than in the winter and my skin can withstand that quite well. If I use self-tanning products, I watch but already on it in addition to maintain, make the Tan last longer and by flaky skin not just disappears. Where erythrulose also here front has the nose, Since she tans deeper than DHA. Interesting, that you can also cooperate mingle self-tanning! Would I not do but, Since I was on the one hand too much afraid of a grazing-result and on the other hand also see no reason, me to Tan. I find very aesthetic pale skin. Can I totally understand, I think not necessarily unaesthetic pale skin. :) Through the erythrulose, I've never had a result of grazing-lucky.